Visions of Jesus Christ.com - Incurable man was healed in Medjugorje. Above photo is of Cristian Felice, world’s first to recover from Lou Gehrig’s Disease. October 6, 2013 Reported at MedjugorjeToday.tv. 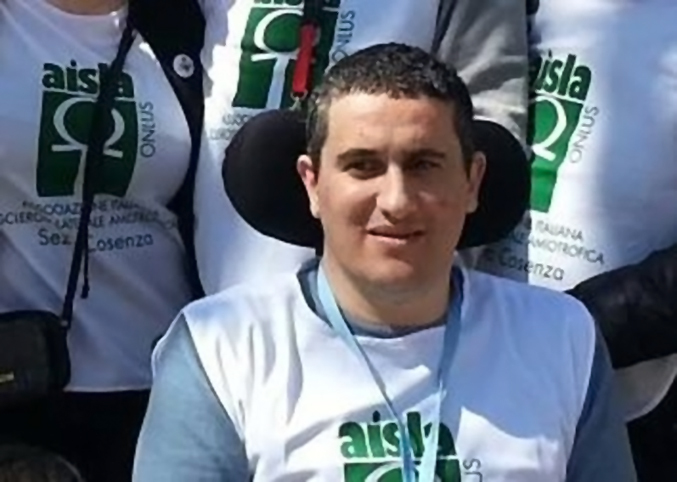 Cristian Felice suffered from ALS which leads to sure death. But while in Medjugorje on September 26, he heard a voice tell him to climb Apparition Hill where he broke into tears. His respirator put away with his feeding tube next, he appears as world’s first to recover from ALS. Amyotrophic lateral sclerosis (ALS) is a killer. Also known as Lou Gehrig’s Disease, the first patient is yet to survive the neurodegenerative disease that affects the nerve cells in the brain and spinal cord. However, this first patient appears to be Cristian Felice, a 37 years old father of two from Piane Crati near Cosenza in southern Italy. What appears to be his healing came about on September 26 in Medjugorje. A patient for five years with his lower limbs paralyzed, Cristian Felice’s respirator has been put away already, and in two weeks time his feeding tube is set to go the same way, the regional newspaper Gazzetta del Sud reported. Cristian Felice tells the regional newspaper il Quotidiano della Calabria that his reflexes have also returned to functioning normally, and that sensation has returned to his legs and his feet. While Cristian Felice’s medical files require further examination, his physical improvement has been attested to by doctors, both newspapers tell. “On September 26, Cristian heard a voice that drove him to climb Apparition Hill. He ascended the hill along with his wife and two priests. They were the ones to see him stand up (from his wheelchair, ed. ), they saw him walk to the big statue that marks the exact spot where Our ​​Lady first appeared to the visionaries. There, they saw him cry” Gazzetta del Sud writes. Overwhelmed by what happened, Cristian Felice is not ready to tell his story yet. Church authorities in Cosenza have been informed of his seeming cure, the regional newspaper Il Cirotano reports. On October 5, a prayer vigil of thanksgiving was held in Cristian Felice’s hometown. Applauded by about 100 people, he arrived by walking along with his wife, a Rosary in hand, Gazzetta del Sud reports from the event. ALS is deadly due to its breaking down the motor neurons between the brain and spinal cord. When the motor neurons die, the brain’s ability to initiate and control muscle movement is lost. With voluntary muscle action progressively affected, patients in the later stages of the disease may become totally paralyzed.